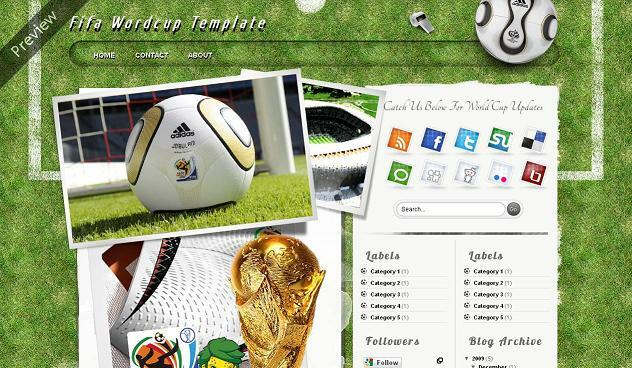 Hi friends ,today we just going to give your the template which many users might be searching for long these days.I haven’t found any soccer template in templates directory for the readers to use.And the football fans would love to use a theme based on it.And the FIFA wold cup is closer too.So we have made the template taking in account the upcoming world cup in south africa.As the theme was originally made by themes rock kitty but we have only changed some images to worldcup images of 2010.I am sure you will be going to like this for sure and many readers asked for soccer theme too.So just enjoy the word cup with putting its latest news on this theme. Other template you may like are NBA and wooden wall. I have added social icons and search bar in demo to the top of sidebar.But you are free to use anything there you like.To add your content just go to Layout > Page elements and you will see add a page element at top right.Just add anything you want.If you want to add social icons and search bar like i did add the below codes in widget. Just change the YOUR-USERNAME with all your profile names on socail sites. If you have any other problems Leave your comments below. So nice very beautiful blogger template. I like it. Thanks. Hey, love the template – thanks. @the popscener see this is what You wanted . Hi, Today World Cup Fifa 2010 is started. I am very thankful to you for shearing great blogger template Fifa World Cup. It is superb. Thanks with best regards. @El i just removed that image code and made move the post section up.